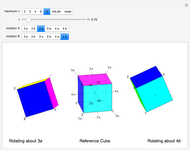 A cube has rotational axes of symmetry through the centers of a pair of opposite edges (two-fold symmetry, six axes), two opposite corners (three-fold symmetry, four axes), or the centers of two opposite faces (four-fold symmetry, three axes). The middle cube shows two examples of each axis; it is slightly transparent. 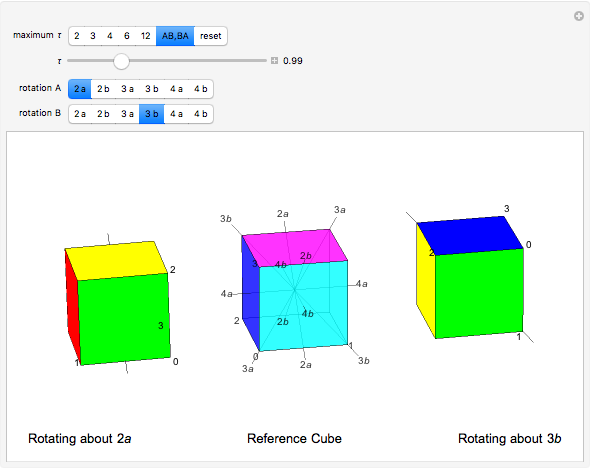 Markers 0, 1, 2, and 3 are always visible, marking the vertices , , , and of each cube. Move the slider. 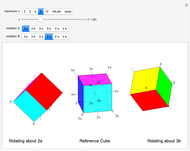 The left cube rotates about the axis and the right rotates about the axis; the axes appear as stubs on the cubes. When is an integer, the edges are once more parallel to the central cube, demonstrating the symmetry, but the original coloring is not recovered until equals the axis number. Try different pairs of axes and change . You can click the picture and drag to alter the viewpoint. Now click "AB, BA" in "maximum " and activate the slider. (Slow the animation down!) The rotation pauses after one complete turn (snapshot 3), giving orientations and . Then the axes of rotation are swapped. The new axes appear and the second rotations are performed. 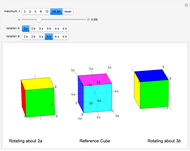 The image pauses again (snapshot 4), with the left cube in orientation and the right in orientation . These are different; in 3D rotations is not necessarily . In real and complex numbers (they are Abelian or commutative); 3D geometry (like many aspects of physics) is non-Abelian. An uncolored cube has rotational symmetry; this is Abelian and is not demonstrated here. In elementary mathematics the order of operations does not matter, that is, gives the same result as . This simplifying assumption leads to many "common-sense" notions that have to be unlearned on proceeding to "higher" mathematics. Roger Beresford "Rotating Cubes about Axes of Symmetry; 3D Rotation Is Non-Abelian"